I made it a point to read the book before I ever got around to watching this movie and it's still kind of shocking to me that it was as big of a box office disaster as it turned out to be. As adaptations of source material go, this movie does an excellent job bringing the book to life. That's not to say it's a bad movie, however. It just feels a little flat in places- but that's not necessarily it's fault. 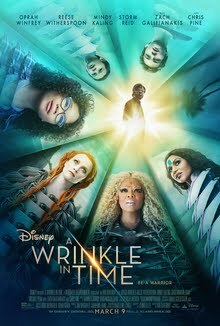 The movie opens with thirteen year old teenager Meg Murry (Storm Reid) struggling to adjust to both her school and home life, ever the disappearance of her father, Alex (Chris Pine), nearly five years before. No one is certain what happened to Alex, but Meg and her mother, Kate (Gugu Mbatha-Raw) think that he proved his theory and was transported to another world. That night, Meg's brother, Charles Wallace (Deric McCabe) welcomes a mysterious stranger, Mrs. Whatsit (Reese Witherspoon) to their house. Before she leaves, she reveals to Kate and Meg that the tessarect that Alex was working on was, in fact, real. The next day, one of Meg's classmates, Calvin (Levi Miller) shows up and they go visit the house of Mrs. Who (Mindy Kaling) who speaks only in quotations and seems to already know Charles Wallace. When the three kids find themselves in their backyard, a giant Mrs. Which (Oprah Winfrey) appears and reveals that three ladies are astral travelers and leads them through a tessarect taking them to the distant and beautiful planet of Uriel. Mrs. Whatsit transforms into a beautiful flying green creature and takes the three of them into the upper atmosphere where they see The IT. The IT, they learn is a dark shadow/entity that's taken over the planet Camazotz. The three women think that Meg's father has been captured and taken there. To confirm that, the tesser to another planet where a seer known as The Happy Medium (Zach Galifianakis) resides. The Happy Medium confirms that Meg's father is, indeed, imprisoned there. He explains that the IT represents all the bad emotions in the universe and only the good people can fight it's encroaching spread. The Three Mrs. propose they go back to Earth to regroup, but Meg's strong will to find her father diverts the tessarect to Camazotz. Upon arriving, Mrs. Which, Mrs. Whatsit and Mrs. Who are unable to stay as the darkness of the IT is too strong, but they give Meg three kids: Mrs. Who's glasses, the knowledge of her faults and a command never to separate. The trio treks through various traps on the planet until they finally reach a beach, where they meet the IT's bodyguard, Red. (Michael Pena). He offers them food and tells them that Alex is safe and happy, but when they are starting to feel comfortable Charles Wallace tells them that the food tastes like sand. Red then starts repeating the times table and hypnotizing Charles Wallace taking control of his mind. Meg and Calvin find themselves in an empty room, which Meg uses Mrs. Who's glasses to get out of the room and free her father. Reunited, they attempt to free Charles Wallace, but he and Red use the IT's power to drag the three of them toward the brain at the center of the IT. Alex opens another tesser and prepares to get Meg and Calvin out there, but Meg overrides herself out of the tesser and goes alone to rescue Charles Wallace herself. Her love for her brother and her acceptance of her own imperfections frees both Charles Wallace and Camzotz itself from the IT. They all return home, Meg's family reunites and Mrs. Who, Mrs. Which and Mrs. Whatsit leave Meg with the knowledge that she can now tesser herself.